Today we went up to Madison,WI to look for hockey equipment for Jack. He has just suddenly outgrown everything we’ve ever bought for him. As a treat we stopped in at Ella’s Deli for lunch and a rousing game of I spy. Ella’s deli has good food and friendly service, but the real draw for us is the amazing collection of toys and trinkets. 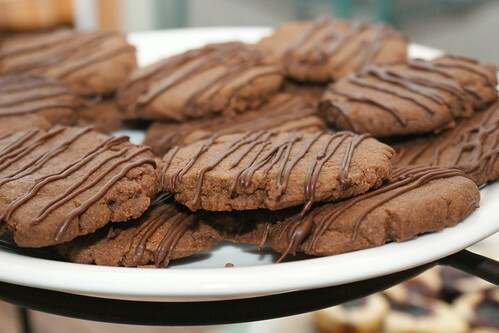 chocolate coffee cookies, originally uploaded by laurasjoquist. I made these cookies for the book club meeting too. I don’t drink coffee but I could have eaten the whole batch of these cookies. I know I’m tooting my own horn, but, Wow! book club pizza spread, originally uploaded by laurasjoquist. 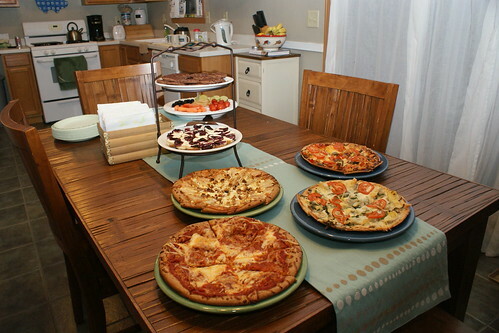 I used our second book club meeting to make pizzas. I had originally planned to make six kinds, but due to purchasing moldy flat bread had to settle for just four. Cheese, Spinach Alfredo and Artichoke, BBQ Chicken and my personal favorite Pear and Gorgonzola. I love pizza. love series, originally uploaded by laurasjoquist. torn, originally uploaded by laurasjoquist. 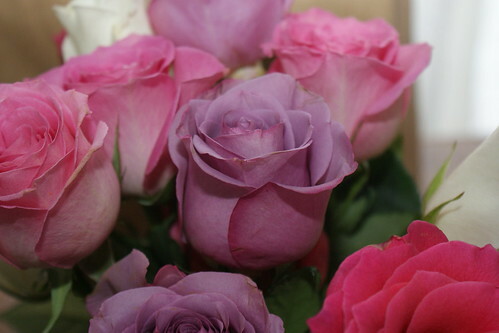 Today while picking up eggs and apples at the grocery store, I took a minute to look through the clearance floral and rescued this bunch of roses for the small adoption fee of $2. I’m not usually a fan of roses, but the lavender are pretty and I’ve been working on a set of “valentine” paintings to hang at Baker Street Cafe in Dixon next month and they seemed like appropriate inspiration. I’ve been salivating over garden catalogs lately looking for things to plant in the yard next summer. We have a new trellis on the deck that needs something climby. The Southern Belle in me says plant a climbing white tea rose that I can sit under in the heat of summer while drinking cool mojitos, The naturalist in me says to plant something native like a honeysuckle that will benefit the bees and the butterflies. And the crazy kid in me says plant a kiwi vine, because it would be cool to be able to say, “I’m growing a kiwi vine”. I guess the only real solution is to get a bigger yard. So, I kind of got behind on the whole 365 days of photos thing and pretty much quit. I don’t feel too bad about it, since I did manage to finish a year last time around. I quit mostly because I’ve become a self-imposed shut in due to the cold weather, an urge to save money and a desire to drive less and save the environment and so I haven’t had much that was interesting to photograph. 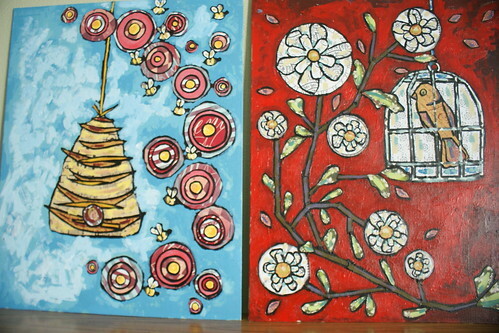 But I have been making softies, painting and updating my galleries. It’s all good. 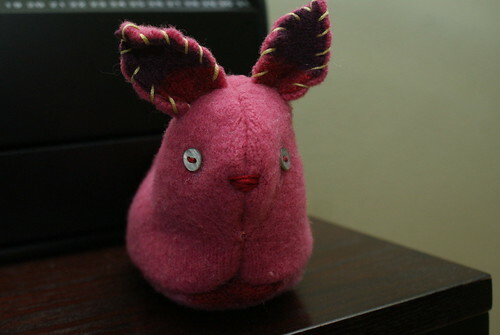 sweater bunny 38/365, originally uploaded by laurasjoquist. I don’t sit still very well. Winter at our house involves a lot of sitting under blankets or in the sun to keep warm. I make animals out of recycled wool sweaters I pick up for a buck at Goodwill (or got free from friends-thank you) to keep myself entertained. On a recent trip to the Salvation Army (on Alpine) I scored a shitload of bright colored wool sweaters and decided to make rabbits for spring, easter, valentine’s day. Whatever. Must keep hands busy. Idle hands do the devil’s work. katie’s cup 37/365, originally uploaded by laurasjoquist. On Friday I hung work up at Katie’s Cup in Rockford. It’s a nice little coffee shop, just a bit out of the way. 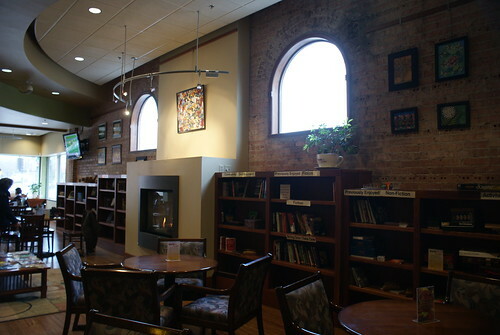 It has a great fireplace though for these chilly days. A Boeing 747-400 passenger jet can hold 416 passengers. This blog was viewed about 5,100 times in 2010. That’s about 12 full 747s. In 2010, there were 307 new posts, growing the total archive of this blog to 387 posts. There were 8 pictures uploaded, taking up a total of 30mb. The busiest day of the year was July 2nd with 139 views. The most popular post that day was Paintings. The top referring sites in 2010 were facebook.com, alphainventions.com, flickr.com, twitter.com, and touch.facebook.com. Some visitors came searching, mostly for laura sjoquist, paintings on rabbits, paintings of ribbon, butterflies painting, and wine bottles.